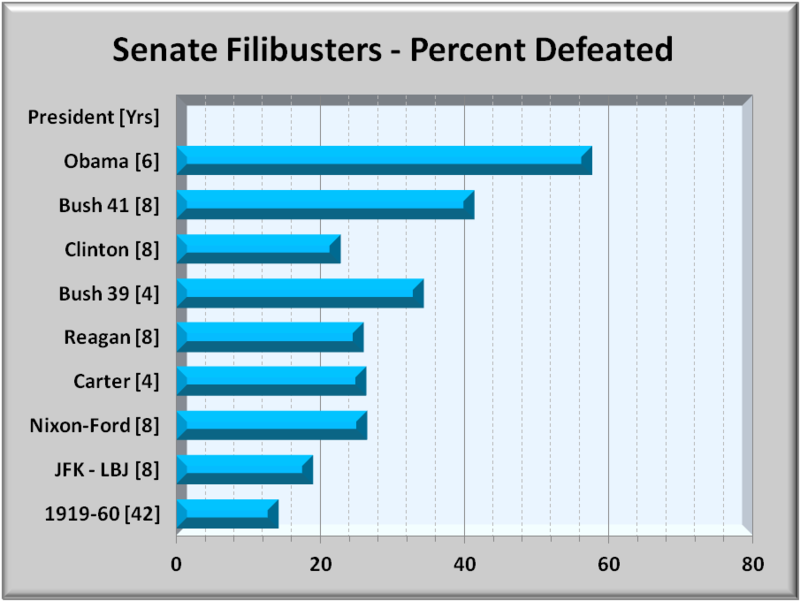 As much as this huge increase in filibusters stands out, even more striking has been their success or failure. For 93 years, the majority of cloture motions to end filibusters failed. 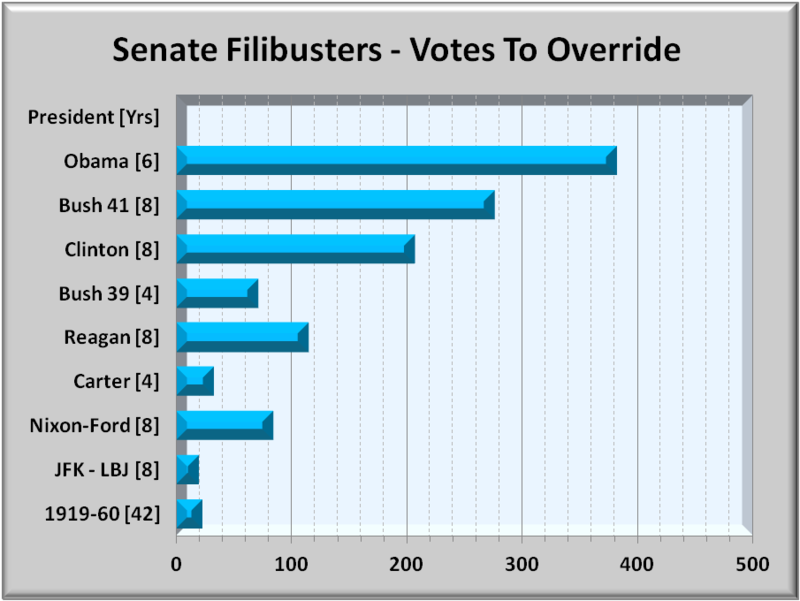 In the 2013-2014 session however, 74% of all filibusters were overridden by super majorities of the Senate. This is not the majority trampling on the wishes of a large minority, but a small minority trying to impose their wishes on a super majority. Clearly, this was not the intent when the Senate set filibuster rules. Rather, this is simply obstruction by a small group abrogating their responsibility to govern. When the founding fathers created the constitution, they put no restrictions on the senate as to debates. Having no limits was one way to restrain a bare majority from ignoring a large minority. Filibusters offered a protection. While there were some lengthy debates in the 19th century, it was during World War I when filibusters got a bit out of hand as some tried to limit U.S. involvement in the war. But so little else got done that President Wilson urged some limits on debate. “In 1917, senators adopted a rule (Rule 22) … that allowed the Senate to end a debate with a two-thirds majority vote, a device known as “cloture.” The new Senate rule was first put to the test in 1919, when the Senate invoked cloture to end a filibuster against the Treaty of Versailles.” In the next 42 years cloture was invoked just 4 times. The Senate posts its cloture data back to its origin in 1919. First, it is noted that only one senator is needed to start a filibuster. Senate archives track three items:  cloture motions filed by at least 16 senators to end a filibuster or debate. Motions are not a vote on the legislation itself, but simply a vote to limit further debate on legislation;  votes on cloture that for years this required 2/3 or 67% of all senators, later reduced to 3/5 or 60%;  cloture invoked whereby this super majority of senators vote to limit debate to 30 more hours thus ending the filibuster. The current senate filibuster rule began 95 years ago, and through 2014. 1,624 motions have been filed to end debate. But its use has not been uniform. 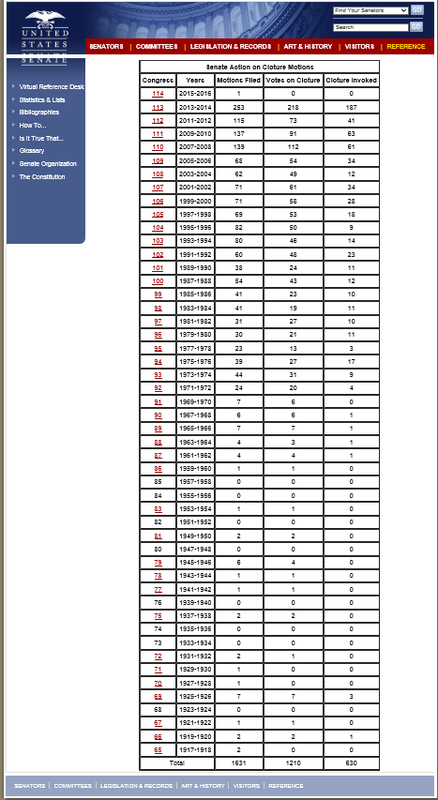 In its first 50 years, only 49 cloture motions were filed. 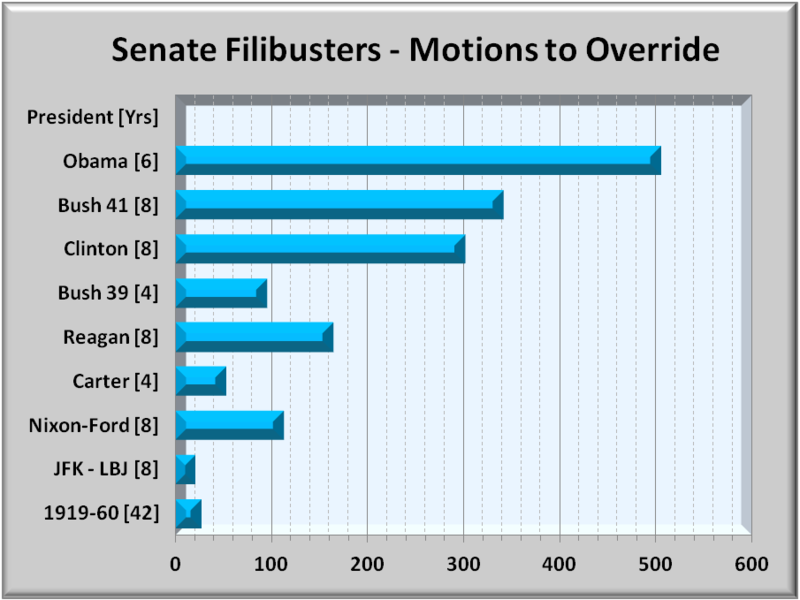 Prior to 1971, senate filibusters were rarely used with cloture motions averaging about one per year. Rarity was no longer the case from 1971 through 2014 as shown in Graph 1 below. For 36 years, cloture motions trended upwards. However, in the last 8 years, they first jumped to over 100 and then in the last session, rose past 250. 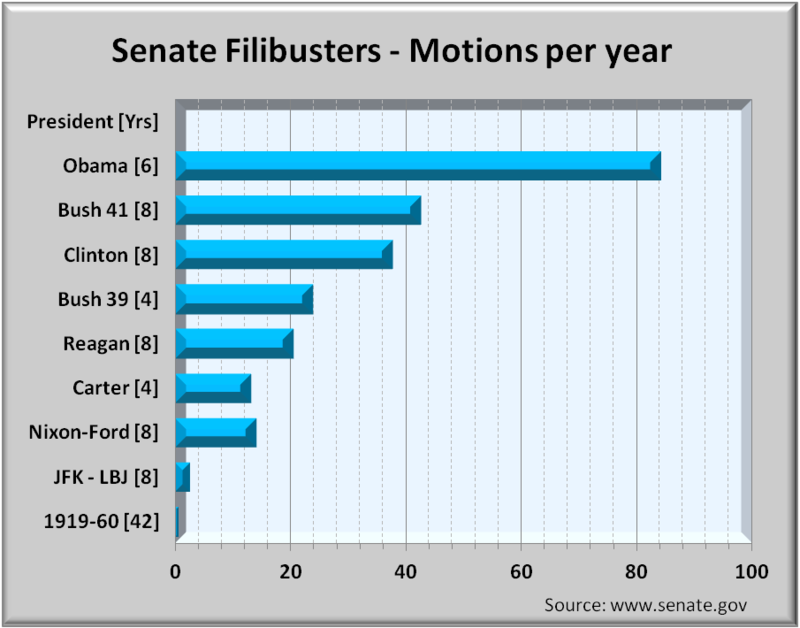 In short, the use of filibusters in the last two years was unprecedented in senate history. 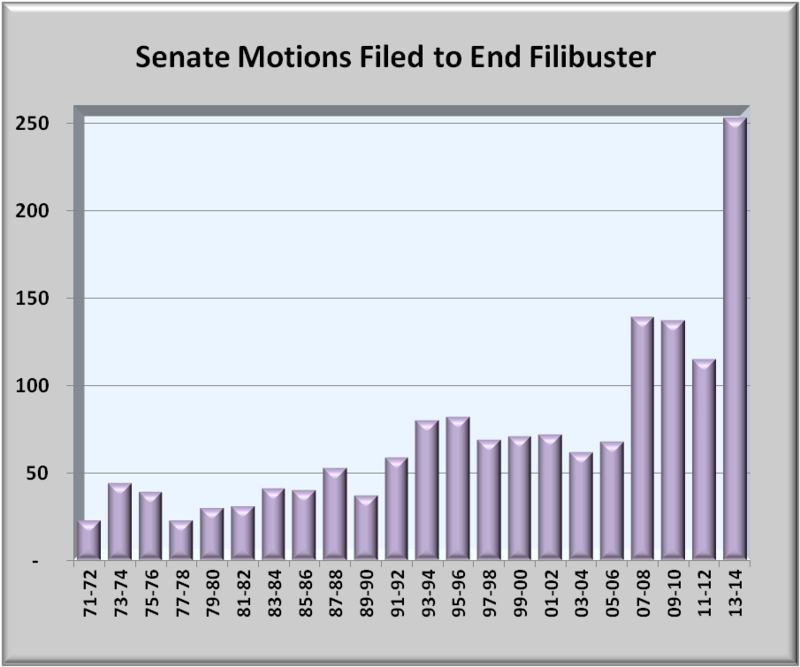 An obvious question is what is behind this fairly drastic increase in the use of filibuster. This analysis explores multiple aspects to identify root causes. The first aspect explored was whether the parties of the President and Senate could explain the use of filibusters. Graph 2 above modifies Graph 1 by color coding the party of the President and Senate for each session. The solid blue bars represent both a Democratic President and Senate. The red blue bars represent both a Republican President and Senate. The green and gold bars represent a mix with the President’s party having a minority in the senate. For all but the last bar, both parties engaged in filibusters to restrain senate legislation. Save for the last session, it is fair to say that both parties used the filibuster to require the majority to consider the minority. Motions were filed, votes were taken, and filibusters were or were not sustained. This graph shows that both parties increasingly relied on filibusters. In 2007-08, the senate majority changed from the party of the President and it was Democrats who were behind the doubling of cloture motions. In 2013-14, motions doubled again, but something else occurred as shown in Graph 3. 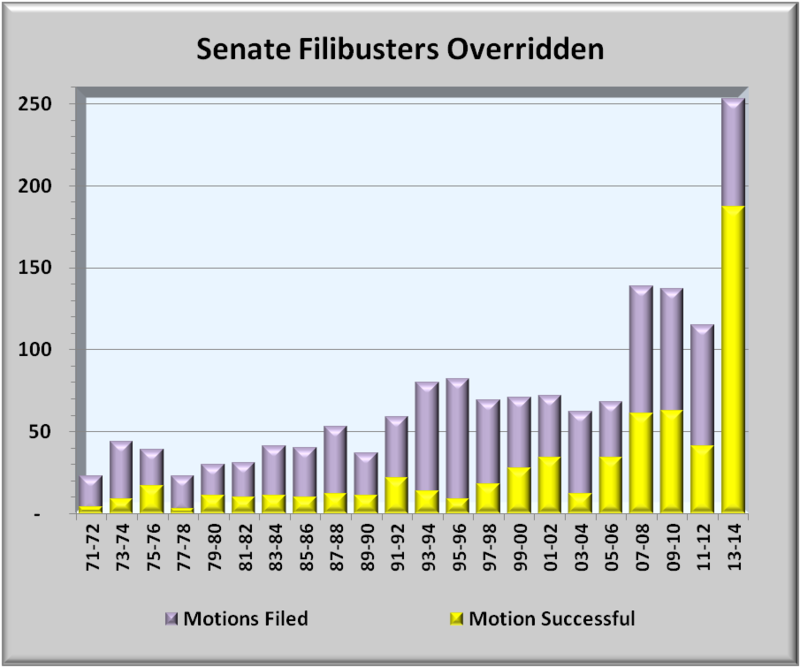 Graph 3 is the same as Graph 1 showing motions filed, but adds yellow bars for the filibusters overridden. For all but the last session, attempts to end filibusters failed over half the time which means they achieved their purpose of enabling minority senators to apply some brakes on the majority. However, the same cannot be said for the 2013-2014 session where attempts to end filibusters succeeded 74% of the time rather than failing over half the time. This is not the majority trampling on the wishes of a large minority, but a small minority trying to impose their wishes on a super majority. Clearly, this was not the intent when the Senate set filibuster rules. Rather, this is simply obstruction by a small group abrogating their responsibility to govern. It also demonstrates that blame for recent senate gridlock is not evenly divided between the two political parties. Rather, the evidence clearly places responsibility on a small group of Republicans sometimes associated with the Tea Party. To be clear, this is not to blame Republicans in general, but only a few disruptive Senators and only in the last session. Another aspect is to view filibusters by President, regardless of the party of the senate. The next Graph 4 shows motions filed per year for Presidents Kennedy through Obama. In this graph there was less than one cloture motion/year (28 in 42 years) to end filibusters from inception up to President Kennedy in 1961. Motions almost doubled under Presidents’ Reagan & Bush 39, then nearly doubled again under Presidents’ Clinton & Bush 41. Finally, under President Obama, motions doubled yet a third time to over 80 per year and more than four times versus President Reagan. Filing motions to invoke cloture sometimes ends the filibuster. Failing withdrawal, the Senate then votes on the cloture motion. Graph 5 below shows a fairly flat trend in percent of motions that went to a vote. 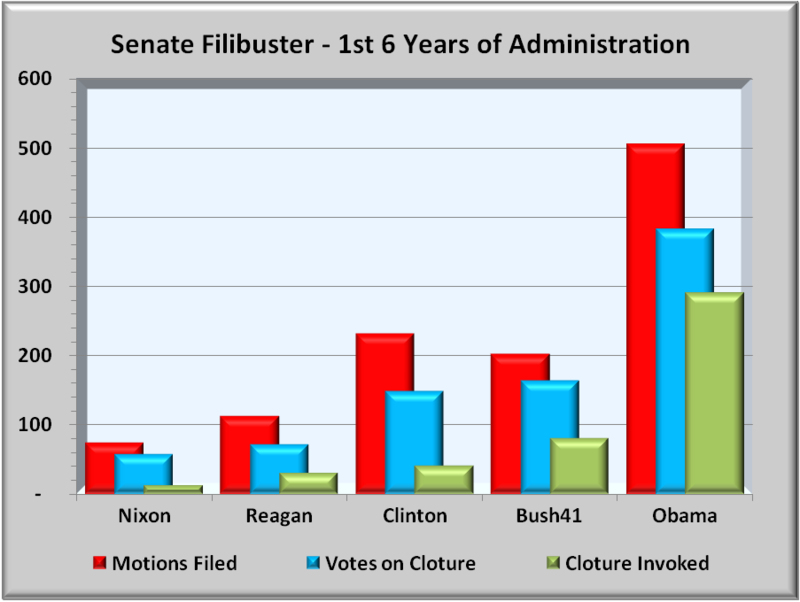 Taking votes on cloture has had little effect on filibuster usage. As suggested in Graph 3 above, the same cannot be said for percent success in ending filibusters. Graph 6 below shows the percent of filibusters defeated by president. For both President Bush 41 and Obama, percents are heavily affected by their two latest years in office. 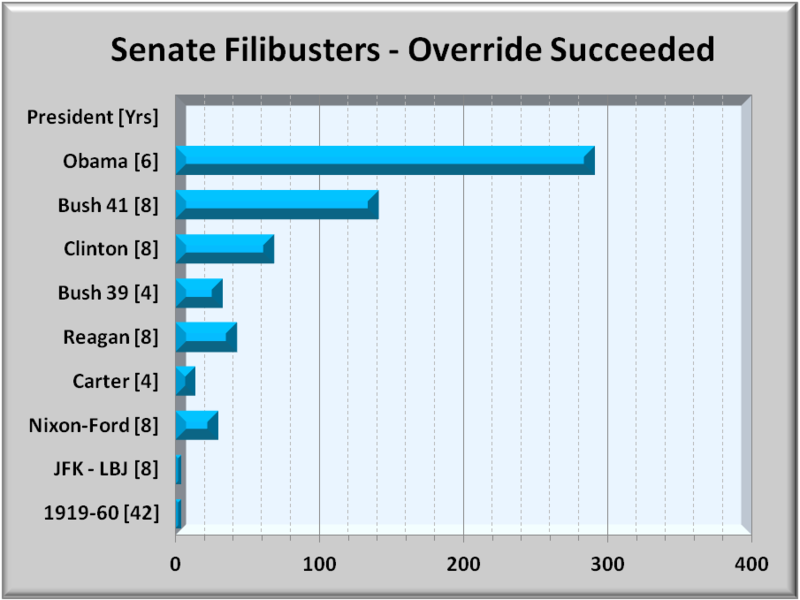 But only in Obama’s presidency is the overall average of filibuster defeats approaching a super majority. Clearly, many minority senators are voting with the majority to at least end debate and allow a vote on the actual legislation. And voting yea or nay is the responsibility of governing. Yet another view of filibusters is to compare the first six years of Presidents Nixon, Reagan, Clinton, Bush 41 and Obama, the last five presidents who had a second term. In Graph 7 below, the red bar is the number of motions filed. The blue bar is the number of cloture votes which alone suggests strong opposition to the filibuster. Finally, the green bar is the number of filibusters overridden, with 2013-2014 Senate having more overrides than all four previous presidents. The key takeaway of this graph is that both Democratic Presidents had filibusters more than double over the same period of the Republican presidents before them. Again, this exhibits a greater reliance by Republicans to use filibusters to restrain the incumbent President. Americans are holding Congress in low esteem because there is little getting done to solve the nation’s problems. Neither party is blameless. Americans want achievement, but that requires both parties to govern. Each party blames the other for the gridlock, but is blame really equal? This analysis shows that with regard to filibusters, recent blame falls more heavily on a small group of Republican senators. Once a rarely used tool, the Senate’s increased use of the filibuster not only has reached extraordinary levels but differs significantly from history. 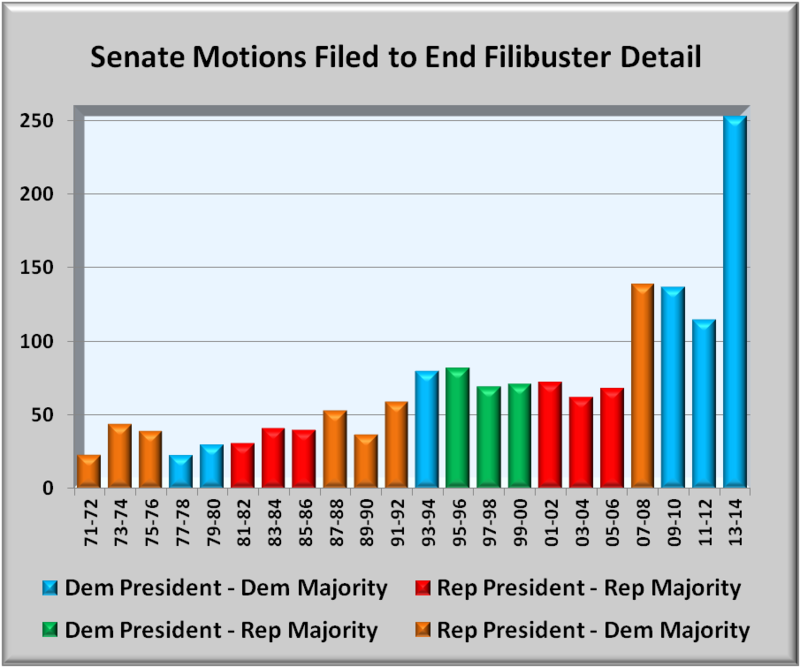 The current senate filibuster rule began 95 years ago, and through 2014, 1,624 motions have been filed to end debate. But its use has not been uniform. In its first 50 years, only 49 cloture motions were filed. In the 24 years from President Nixon through Bush39, 427 motions (18 per year) were filed. In the 8 years from President Clinton through Bush41, motions increased to 643 (40 per year). Finally in 6 years of President Obama, 505 motions were filed (84+ per year). 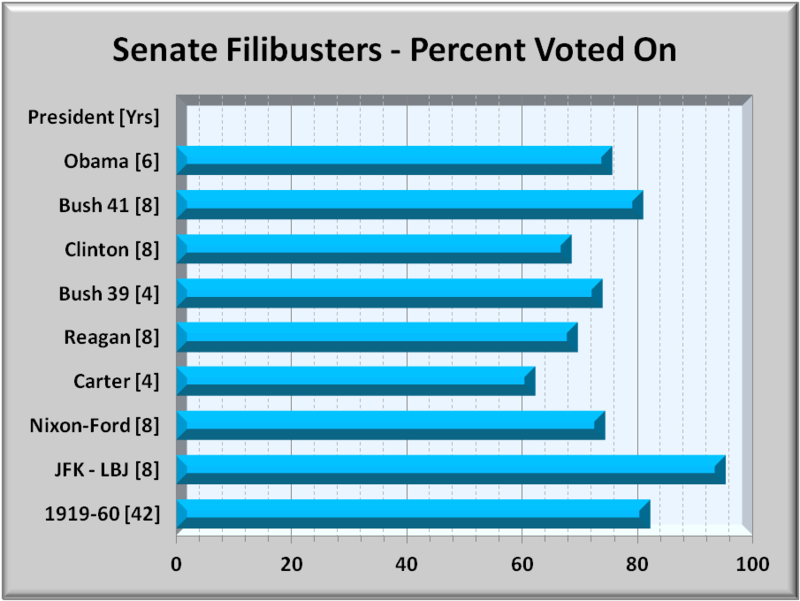 As much as this huge increase in filibusters stands out, even more striking was their success or failure. For 93 years, the majority of cloture motions to end filibusters failed. In the 2013-2014 session however, 74% of all filibusters were overridden by super majorities of the Senate. Still another apparent trend is for Republicans to sharply increase use of the filibuster when the presidency changes from Republican to Democratic. While not conducive to results, it is a method Republicans have felt very free to use.